ZeroFragrance HydroFoam is our luxe foam moisturizer. Potent antioxidants are aerated in our micro-bubble mousse to fight oxidation without clogging pores. We added zero essential oil. We chose natural marine and botanical ingredients that have little or no aroma. Based on trials there is no perceivable aroma to the ingredients we’ve selected. Luxe foam moisturizer is a technological breakthrough in prestige skin care. HydroFoam helps plump the skin and smooth fine lines! Potent antioxidants are activated in our micro-bubble mousse to fight oxidation without clogging pores. Apply to freshly cleansed skin for superior, all-over hydration. Ideal for around the eyes where skin tissue is especially delicate. Our light-weight moisturizer should be applied prior to your primer and other makeup application for flawless coverage. HydroFoam helps to protect delicate skin around the eyes. Paraben and glycol-free, the skin pluming technology will not burn or sting the eyes. • Hyaluronic acid: Hyaluronic acid (Sodium Hyaluronate). Hyaluronic acid helps regulate cell renewal, lubricate tissue and generally maintain skin’s elasticity. Our body naturally produces hyaluronic acid. When applied topically, hyaluronic acid can hold up to 1000x its own weight in water, which has amazing benefits for dehydrated skin. • Ceramides [ser-a-mides]: Ceramides are lipids found within cell membranes at very high concentrations. 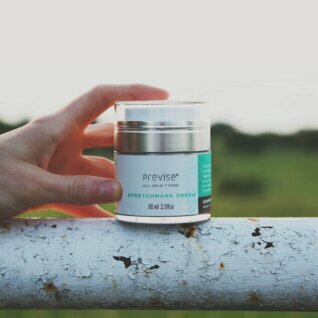 When applied topically, ceramides help form a protective layer, plump the skin and retain moisture. • Phytosphingosine [fyto-sphyng-o-sign]: Naturally present in the skin, phytosphingosine helps to minimize signs of acne, inhibit the growth of micro-organisms on the skin, and may reduce redness and some inflammation. • Omega 9: Extracted from Castor Seeds (Ricans communist). The seeds are cold pressed to produce a lovely shiny, pale yellow oil. Omega 9 Ricinoleate adds gorgeous, light-weight moisturizing properties without clogging pores. 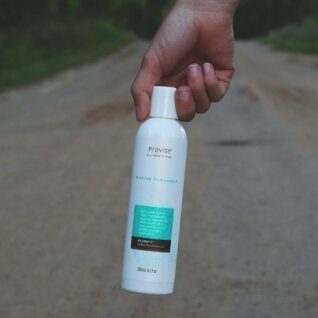 • Glycerin: Our glycerin is kosher and sourced from sustainable palm oil. Glycerin is a natural humectant, which means it helps draw moisture from the air. Glycerin works with ceramides to help form a protective layer, plump the skin and retain moisture. 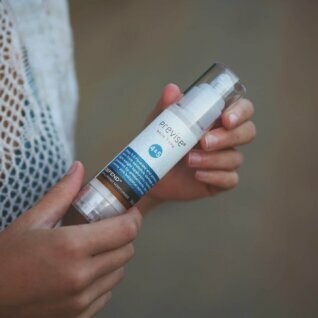 Apply HydroFoam® after using Previse Nutrify Ozone Defense Serum to lock in the vitamin benefits. • Use before primer when applying makeup to help protect skin and pores. Hyaluronic acid helps to plump and smooth skin for even coverage. • Depress the aerator once or twice into the palm of your hand to activate the micro-bubble technology. • Using your fingertips gently apply HydroFoam onto all areas of your face and down your neck. Your face will be slightly moist after application and until completely absorbed. I purchased this product because I have been seeing noticing fine lines showing under my makeup as I age and wanted a way to smooth my makeup while also moisturizing. The foam is in an opaque, plastic white pump bottle with a clear plastic cap to prevent the moisturizer from evaporating. 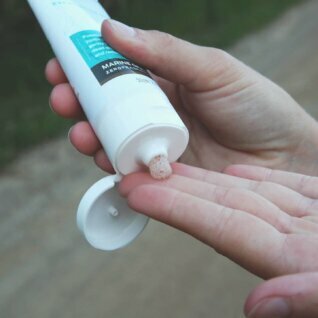 Though it is a smaller bottle, because the liquid gets foamed by the pump it lasts a long time. The foam comes out similar to a foaming hand soap that is quite light. Though it is “naturally unscented”, I get the slightest aroma of fennel when first applying. I apply it before my base when putting on makeup. Immediately afterwards it leaves my face lightly damp, but it is soaked in within a minute or two. After using this moisturizer my makeup goes on much more smoothly and I have no signs of lines. I also appreciate that after using this moisturizer regularly there are fewer wrinkles on my face when I’m not wearing makeup. My skin is firmer, brighter, and my crow’s feet are less noticeable. I would recommend this foaming moisturizer to those who want to lessen the signs of aging while also moisturizing dry skin. I have already gone through a whole bottle of Previse Hydrofoam. I can say without hesitation that I love this stuff and consider it a staple in my skincare routine. To give you a little background of my skin type…I have combination skin (very oily t-zone area and slightly dry on the lower cheek area and some other patches). I have highly sensitive skin (and not just saying that, it actually breaks out in bumps when I put almost any product on it) and for that reason, I am very careful about the ingredients I use. I am mid 30’s, so of course hormonal acne has now entered my life on top of everything else. I ditched almost all of my expensive face products that were actually causing more harm than good based on all of the chemicals in it. My current routine now is BioDerma Sensibio H2o micellar water morning & night. I will oil cleanse with just Coldpressed Argan Oil about 1-2 x per week just to give my pores a deep cleaning. 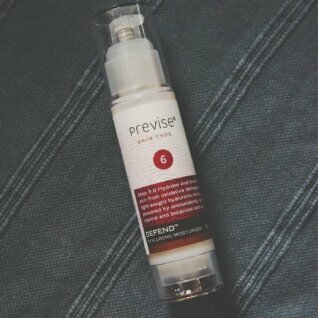 I have been using Previse Hydrofoam as my moisturizer both AM & PM as well now and it has been good to me. Because it is a water based foam moisturizer, it is the perfect fit for my combination (leaning more to the oily side) skin. I was a little worried about the Marine Algae ingredients because Algae Extracts are rated 5 on comedogenic scale, but after doing some research, It seems as though that ingredient has a lot of very beneficial qualities. Other great brands use Algae extract in their products which are rated extremely highly from folks with sensitive acne prone skin. No pore clogging has occurred so far from using Hydrofoam so I am no longer concerned with it being included in the formulation. What skin types would love this product the most? I would say combination or oily, sensitive, and acne prone skin types will no doubt love this. If you have dry to very dry skin, you will also love this, but may find you need to follow up with little more of an emollient moisturizer. This watery based foam and dries down very quick once you put it on your face….truthfully, I find this work as an amazing primer under makeup! It is so gentle around the eye area where normal products tend to irritate me so that’s a huge plus. Final Verdict? I think this product is a well formulated one and will be loved by most. If you have super dry skin, you may need a follow up moisturizer but you will still love this foam as a primer under makeup (will keep your makeup from sliding down your face!). I purchased this product from another website initially, but I am loving this product so far. The Hyaluronic Foam is the holy grail. It is light and moisturizing while keeping your skin soft and supple. I use it after my vitamin C serum and before sunscreen. HOWEVER, the best part is for moisturizing my under eye area before make-up. I cannot use a regular cream because it makes my mascara (even the tube kind) slip and slide. With HydroFoam, my eye get the moisture and my under eye area looks GREAT. 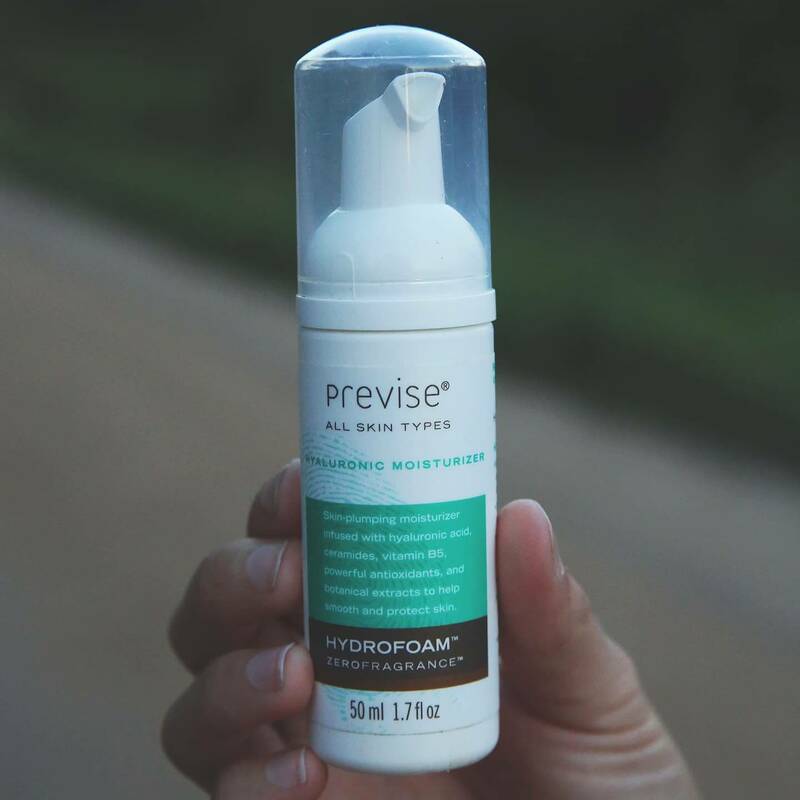 Been using this bottle of HydroFoam moisturizer by Previse for about 2.5 weeks now and we love it. It is not greasy at all but yet very moisturizing. I only need to use a thin layer and it absorbs fairly quickly. I have normal to oily skin and this moisturizer suits me really well, it doesn’t drag my skin down, doesn’t feel heavy or sticky. My husband has really dry skin around his eyes and he has been using it for about a week now and I do see some improvements, his skin doesn’t crack when he smiles anymore lol… definitely looks more hydrated and less fine lines. This is an amazing product and it does the trick for me. The foam formula is light, which makes my face feel healthy and fresh. If you have combo skin, this is a no-fail moisturiser that will boost your skin and give you that nice plumping effect.